(NYT, Elisabeth Malkin, 11.Apr.2019) — President Andrés Manuel López Obrador envisions a future in which Mexico produces more oil, gasoline and electricity. But his strategy to get there relies on reaching back into his country’s past. Breaking with a five-year-old energy overhaul that opened Mexico’s closely held oil industry to the private sector, Mr. López Obrador wants to spend billions of dollars to strengthen the dominance of Mexico’s state-owned energy companies. “We are going to rescue this industry that is so important for the country’s development,” Mr. López Obrador told workers recently at a rusting oil refinery in Tula, about 45 miles north of Mexico City, as he accused previous governments of “plundering” the industry. Mr. López Obrador, a proud leftist, has said he intends to restore the glory days of the national oil company, Petróleos Mexicanos, or Pemex, when it helped make Mexico self-sufficient in energy and provided hundreds of thousands of well-paying jobs. Weeks after he took office in December, the president gave the company a new slogan — “For the rescue of sovereignty” — that tapped into a deep vein of nationalism that binds the oil industry to Mexico’s very identity. Many Mexicans share the president’s reverence for Pemex. The former monopoly is still one of the country’s largest employers, funds 20 percent of the national budget and dominates the economy of states on the Gulf of Mexico coast. But the company and Mexico are both in a far different time from when the 65-year-old president came of age in Tabasco, a state in Mexico’s oil country. 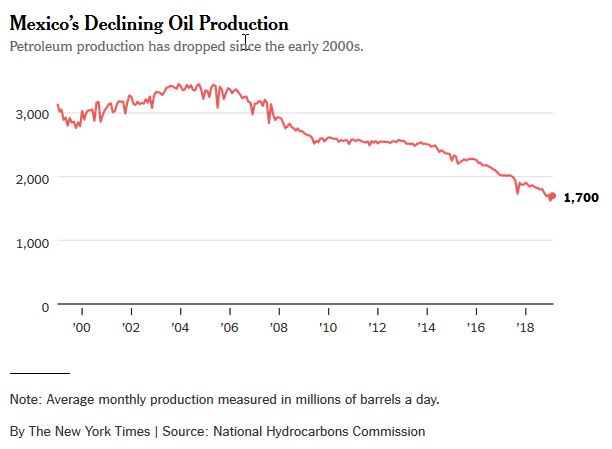 National oil production has declined to about half of its 2004 peak. Mexico was the world’s 11th-largest petroleum producer last year, down from fourth biggest in 2002. And analysts say that the company is inefficient and lacks in technical sophistication. To halt the decline, Mr. López Obrador’s predecessor, Enrique Peña Nieto, broke Mexicans’ historical resistance to private investment in a bid to attract money and technology. Although Pemex kept most of the country’s reserves, the government began to auction rights to explore and produce oil to investor-owned businesses. Mexico also allowed foreign investors to expand their presence in the power industry. Mr. López Obrador has said he will not change the energy laws his predecessor pushed through, but in practice he is beginning to dismantle those policies. The government has shut the door on most new foreign investment in energy — whether it involves oil exploration or private wind farms. At the same time, Mr. López Obrador has begun to name loyalists to replace independent energy regulators and Pemex board members. Critics warn that Mr. López Obrador is sinking public money into reviving a fossil-fuel industry that is fast being overtaken by new, cleaner technology. Ms. Melgar said that the president was right to seek energy sovereignty but that he was defining it too narrowly. Had he kept the industry open to private investment, Mexico would have gained technical know-how and financing to develop a variety of energy resources, including wind and solar power, she said. One of the biggest problems is that neither Pemex nor the state-owned power company, the Federal Electricity Commission, has the money to carry out Mr. López Obrador’s vision. Nor do they have the expertise in technology like deepwater drilling or renewable energy. The situation at Pemex is especially dire. Carrying $107 billion in debt, Pemex is the world’s most indebted oil company. Its January oil production was its lowest in 40 years, while its creaking refineries are running at about a third of their capacity. Corruption and mismanagement have inflated operating costs. And Mexico levies hefty taxes on the company’s profits. Most analysts estimate that the company needs to invest at least $20 billion. Although the government has sharply increased Pemex’s budget for oil production, cut taxes and cracked down on fuel theft, the company’s spending will fall far short of that target. Mr. López Obrador has said Pemex will spend $8 billion to build a new refinery in Tabasco in just three years. Analysts say the speed and low cost are not credible, especially considering Pemex’s spotty record. The project is the centerpiece of Mr. Lopez Obrador’s plan to end Mexico’s growing reliance on gasoline imports from the United States, which account for about two-thirds of national consumption. Critics said he was putting billions into a corrupt and inefficient division of Pemex, rather than concentrating investment on increasing crude oil production and buying cheaper and cleaner gasoline from American refineries. At the electricity commission, Mr. López Obrador has handed control to Manuel Bartlett, an 83-year-old politician who is a staunch opponent of private energy investment. Mr. Bartlett has also declared solar and wind power to be unreliable and expensive even as prices for renewable technology have fallen sharply. In January, the government canceled an auction for the right to generate wind and solar energy even though previous auctions produced some of the world’s cheapest electricity prices. Greenpeace, the environmental group, said that without more investment in renewables, Mexico would not meet the emissions reduction targets that the country agreed to under the Paris climate accord or comply with its own clean energy laws. Mr. López Obrador has not entirely ruled out a role for private investment. He has challenged private oil companies that entered Mexico in recent years to hurry up and start pumping oil in competition with Pemex. “No ideology, no politics, a practical trial, results — let’s see who does it better,” he said. Private companies met with the president in January to explain their progress and make the case for new oil auctions, said Alberto de la Fuente, president of the Mexican trade association for energy companies. But he warned that if the delay in new auctions dragged on, some investors might lose interest in the country. The president and his aides have said he is simply undoing the most unpopular parts of the previous government’s energy policies. Mr. Peña Nieto said his reforms would increase oil production, create jobs and reduce energy prices. But oil production has continued to fall and the industry has shed jobs as global oil prices plunged in the last two years. Yet consumers are paying more because the government also reduced subsidies. The president is “listening to people’s concerns,” said Abel Hibert, an energy adviser to Mr. López Obrador. Mr. Hibert said the president would consider restarting auctions if private oil companies met their production goals. “The president understands the need for the private sector,” he said. But such reassurances have done little to comfort investors and analysts who fear that Mr. López Obrador is reasserting too much government control over the energy industry and shutting out foreign investment. Ratings agencies have warned that they might downgrade Mexican debt, in part because of the amount of government spending to prop up Pemex and the electricity company. John Padilla, the managing director of IPD Latin America, an energy consulting firm, said Mr. López Obrador did not appear to understand how his energy policies were hurting the economy.